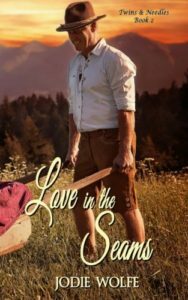 Love In The Seams by Jodie Wolfe is a delightful Christian historical romance. It is the second book in the Twins And Needles series but can be read as a stand-alone. Love In The Seams will certainly warm your heart. It is very reminiscent of Little House On The Prairie in that it is a warm, family novel. Five year old LillyAnn is so adorable. Jodie Wolfe has wonderfully captured her mannerisms and speech. I could ‘see’ her in my mind’s eye. The novel has the theme of searching. Everyone is searching for something whether it is a physical search or a longing of the heart. There is also the theme of dreams. We all have dreams and work at making them come true. We need to surrender our dreams to God, Who will always have a plan for our lives. God is at the heart of the novel. Characters make church a priority but faith in God is more than going to church. Characters talk to God in prayer, seeking guidance for their lives. Jodie Wolfe shows how faith in God is a living relationship. “God will be there for you no matter what.” God never leaves us to do life alone. 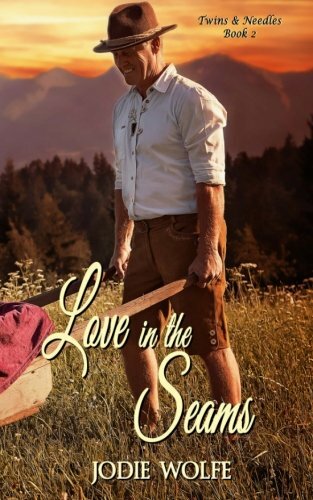 Love In The Seams shows how delightful small town living can be. The pace of life in 1875 is slower than today. People find pleasure in the simple things. This reader certainly had a yearning in her heart to be part of that community. Love In The Seams is a perfectly wonderful story. The characters just take up residence in the reader’s heart. LillyAnn is delightful. I loved the story. It was a perfect read. I have heard so many good things about this book — I will have to get it and start reading. Thank you for your sweet review. I’m truly honored. I hope you enjoy reading it, Connie. 🙂 I’m excited to hear you are hearing about my new book.